I am not the least bit patriotic. I don't have a flag that I fly in my back yard unless its a geek flag. Generally speaking I do not feel a burning passion erupt from the bottom of my soul when I think of the USA or even the old dusty stars and stripes. Quite frankly I have some gripes with American history in part as an African American and in part as a tax paying citizen entrenched in a healthcare system badly in need of some reform. However, I am American and I am a Washingtonian. There is no escaping the 4th of July here even if I dug a borrow from now until a week later. People love that jazz here and let's admit it the fireworks displays are epic. Also while my soul doesn't burn for the stars and stripes it does brim with respect and admiration of our veterans and active duty soldiers. As such I do like to give these things a good old college try but it's always gonna be my way which is a little bit of funky mixed with a little bit of whatever is on hand. In short welcome to my graffiti style 4th of July. 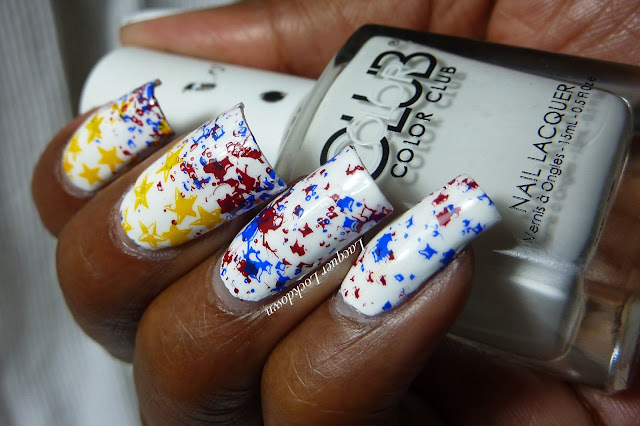 I really wanted to do a watermarble but the supplies were not on hand. They are messy and kinda beat up. In short graffiti perfect! On super hot days like the 4th I wear shredded recycled jeans that I've converted to shorts and plain wife beaters. Lol these nails go perfectly. 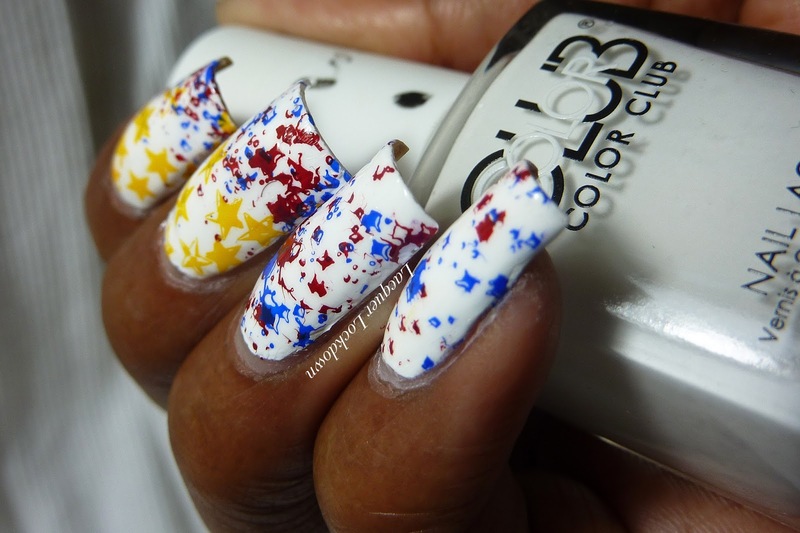 My version of stars and stripes is pretty simple the added bonus is I didn't have to bother with a straw and all the messy cleanup involved in a splatter mani. Thinking of this and how much I freaking love my Shinaneghans plate because it's so easy to work with makes me think I need to pick up a few more plates with splatters on them :) Btw here's a quickie tutorial for this one. And there we have it. Looking at this now I kinda wish I could make this into a t-shirt. In any case I everyone has a safe and fun day and since I know most of my readers are not American please enjoy the weekend. I've still got heaps of plate releases piled up as well! Thanks for reading and I'll see you next post!